How to use ‘stop’ with another verb is difficult to remember for some students but there is an easy way to remember how to use it correctly. Using ‘stop’ with the infinitive (i.e. ‘stop to…’) means pausing because there is another different action that the person or thing does. I had to stop to think about which way to go. Will you stop to pick up some milk on the way home? 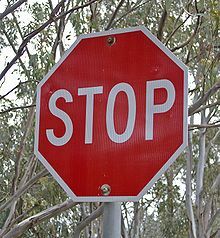 Using stop with a gerund (‘stop ..ing something) is generally used to talk about quitting something. The doctor told him to stop smoking. I need to stop working so hard. Sometimes, using ‘..ing’ verbs that are not gerunds but continuous verbs make things difficult. If the ‘~ing’ does not come at the end of the clause or is not followed by a noun phrase then you may have a case like the one below, which is stop + infinitive. I had to stop cooking to answer the telephone. In infinitive forms, ‘and’ often replaces ‘to’. I had to stop and think about which way to go. I hope you don’t need to stop to think too much about how to use this verb in the future. Posted on 24 March 2014 23 March 2014 by Marc	This entry was posted in Grammar and tagged gerund, infinitive, stop, verbs. Bookmark the permalink.